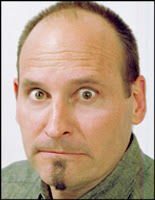 In January 2008, the Library of Congress Center for the Book and Children's Book Council named Jon Scieszka as our country's first National Ambassador for Young People's Literature. Scieszka is the author of wonderful books, including Knucklehead, the Time Warp Trio series (I am quite partial to the audio recording), the Truck Town books, The True Story of the 3 Little Pigs, and, of course, The Stinky Cheese Man. Basically, if you have a boy reluctant to read, grab ye some Scieszka. In fact, Scieszka is so passionate about getting kids to read (and particularly boys), that he created Guys Read, a website dedicated to recommending books to boys. It's hard to imagine a better choice for our first National Ambassador. Scieszka has been talking on NPR, talking to Martha Stewart about books, recommending books for your kids, and appearing at events like Children's Book Week. What's he been talking about? How to get our kids to read, what books kids will like, and why children's literature is awesome. As our first national ambassador of young people's literature, I am pleased to report that the world of children's books is rocking. Thanks, Jon, for all your hard work as our National Ambassador for Young People's Literature. And for more on Ambassador Scieszka, head on over to A Year of Reading where Franki and Mary Lee will be rounding up posts from around the kidlitosphere. Thanks for the kind words Abby. I'm glad to be able to help the hard-working librarians of the world. I agree with Mr. S: Librarians Rock!